I professed my love for making natural Christmas wreaths in the past. After I made the Joy Wreath Sign last year the questions poured in how to make one… or if I could make one for them. So this year I decide I better get things together to show you how to make some natural outdoor Christmas decorations yourself. 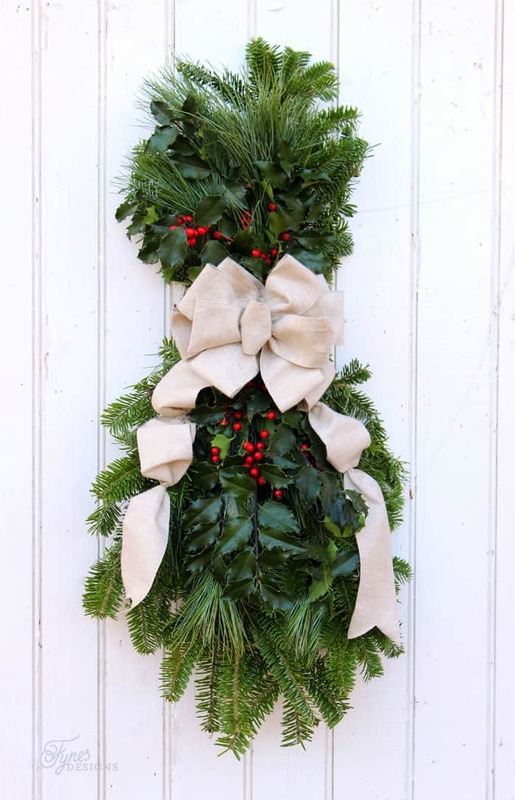 I thought I would share how to make a Christmas door swag first as it is a bit easier of a project, and tomorrow I’ll be sharing how to make a natural wreath (although, still easy, once you know a few tips). 1.) Push the sides of the coat hanger to the centre, stretching it into a long line. Using a pair of pliers, bend the hook of the hanger into a loop for easy hanging. 2.) Start with a long sturdy fir branch that is approx 18″ long, for the swag base. 3.) Layer the bottom branch with two additional sturdy pieces approx 16″ long. 4.) Make a similar arrangement of three branches, with the ends pointing in the opposite direction measuring approx 10- 12″ long. 5.) Twist the end of the floral wire around the coat hanger to secure. 6.) 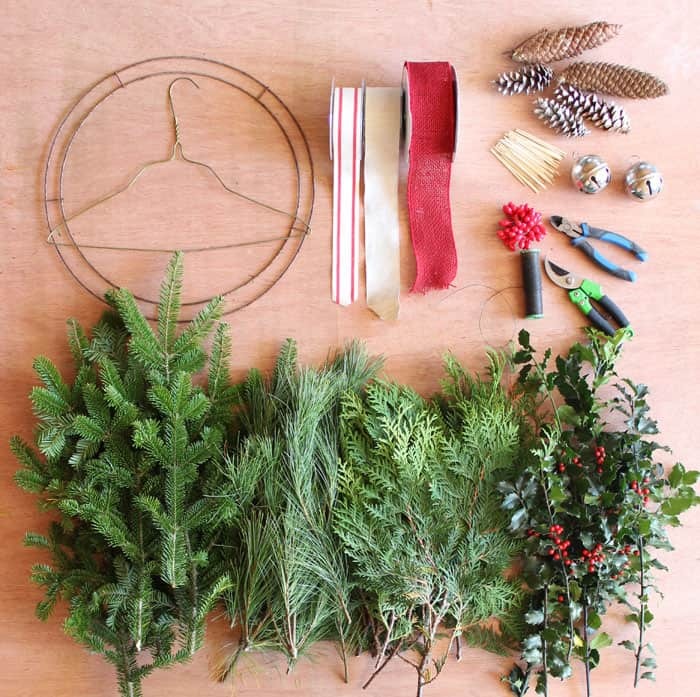 Layer the six fir branches together on top of the coat hanger. 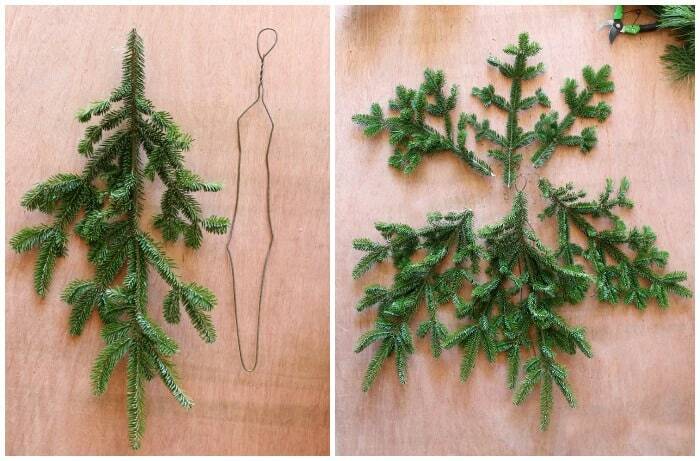 Twist the wire around the entire bunch of greenery multiple times, securing it to the hanger. 7.) Add in additional layers of cedar/ pine/ holly in the same manner as you desire. Secure with a wrap of wire with each additional layer. 8.) 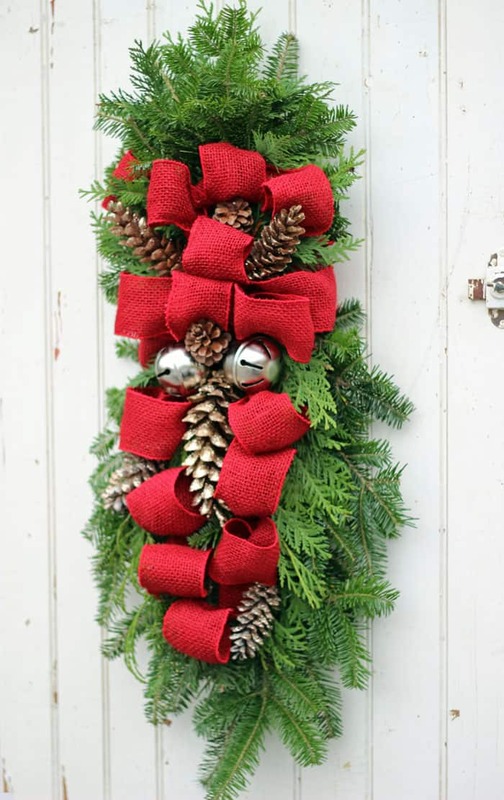 Embellish with ribbon, bells, pinecones, and small ornaments. When you’ve mastered the swag, you may want to move beyond the basic bow. Below are a few tricks I use to attach ornaments. 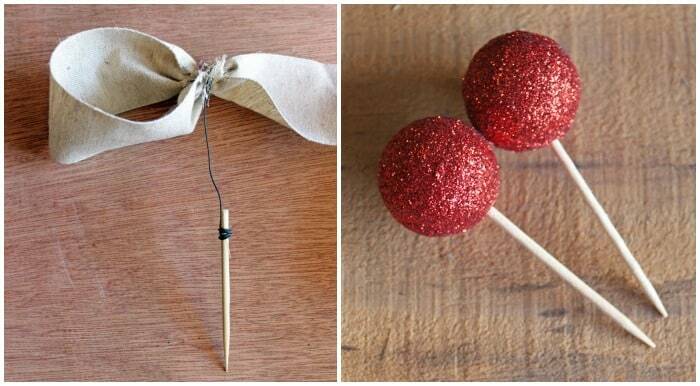 You can use toothpicks or skewers wrapped with a small piece of wire. This will allow you to poke the decorations right into the greenery. I love how vibrant this wired coloured burlap from May Arts Ribbon is. It really makes the swag pop! I think I’ve used this Natural Cotton Burlap Blend on the Christmas swag below on about 10 projects this year too. Definitely on my list of favourites. I love how easy it is to make a Christmas swag. It’s one of my favourite Christmas decorations, relatively easy to make and very affordable. Give it a try an be sure to stop by the Fynes Designs Facebook page to share your creation. 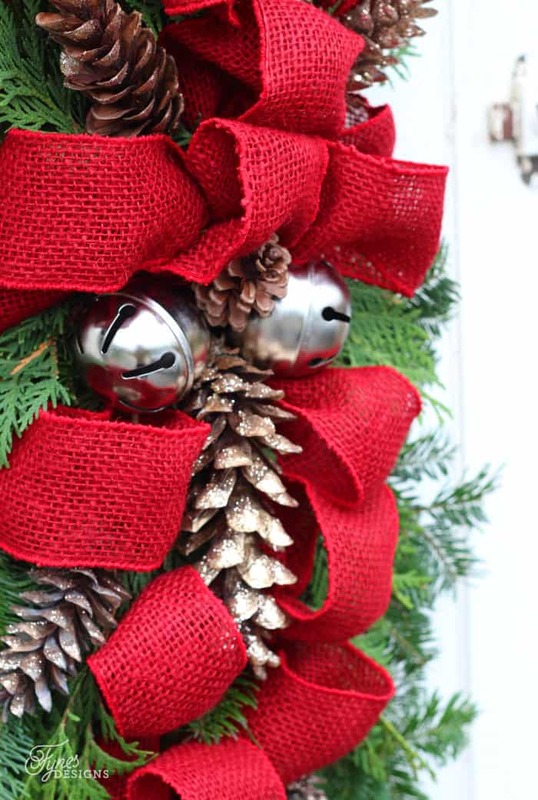 Plus click over to learn to make Natural Wreath too! *This post may contain affiliate links. By purchasing an item I will receive a small percentage which helps me fund this website. Thank you! This is beautiful!! Pinning to the Monday Funday board! Love your swag and you make it look so easy. Thanks so much for showing us how to make our own. Funny, I thought I could smell this while I was watching the tutorial! Very pretty! and it’s getting me in the Christmas mood! I hope you make one, please share a photo on my FB page when you’re done, I would love to see it! These are just gorgeous, Virginia! 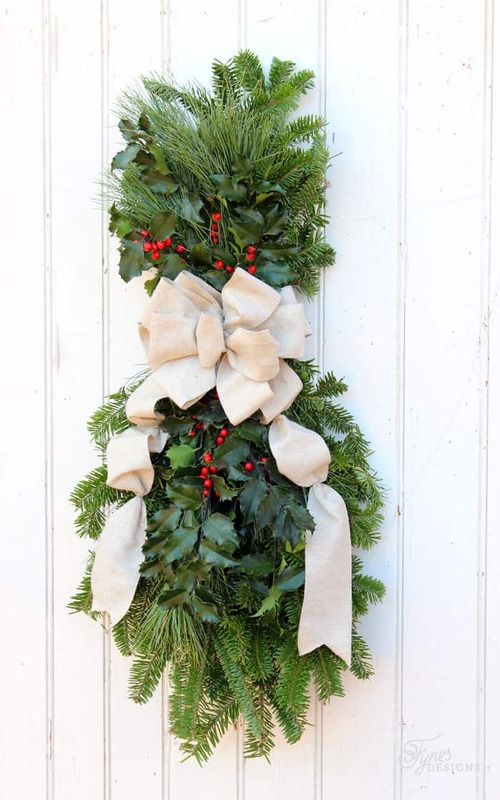 I definitely want to try some natural swags and wreaths this year. Thanks for sharing! Love this idea. I have several large Box Woods, can I use them? Oh my goodness yes! I so wish I had had boxwood plants. I have two tiny guys I can’t wait until they get bigger! I would LOVE to see it if you make them… I’m a little jealous! Can you help with a little direction on the bow and how you start it and secure it? I love these and want to make one for you my door but need help with the bow. The ribbon is very easy to do (I just forgot to take photos along the way) You use one continuous stand of ribbon. Make a loop and twist a piece of wire around, use the wire to attach it to the brush (like a twist tie) make another loop (repeat the process)nestle the connecting piece underneath a piece of brush. I hope you can follow that! These are so beautiful, I will definitely be doing this with the grandkids this year! Will the holly stay green for several weeks? Thanks again for the instructions. You’re most welcome! Thanks for swinging by! I just made a swag following your instructions – you made it so easy. WOW! 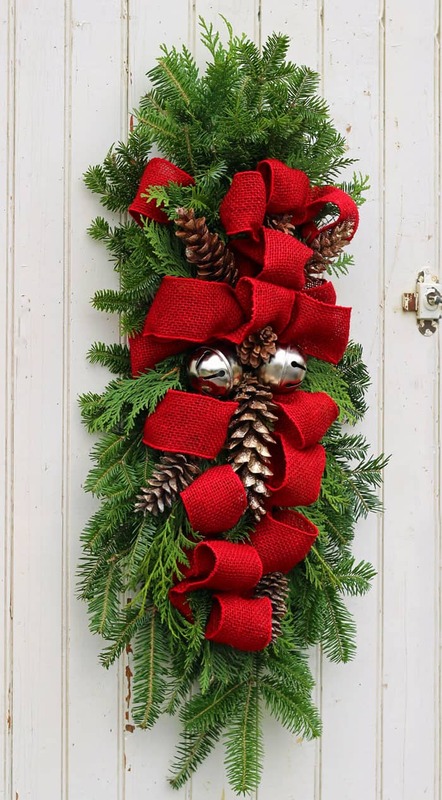 I’ve always admired these swags and wreaths but been scared of having a go at making them. Now I can’t wait to go out and pick some greenery! Thanks SO much for sharing your knowledge, and being so inspirational. Hi just stopping by the let you know that this awesome post was picked as one of the highlights this week on the #HomeMattersParty linky. You can find it at http://adventuresfrugalmom.com/home-matters-linky-party-63/ make sure to grab the I was featured button for your side bar. Congrats. These are beautiful! 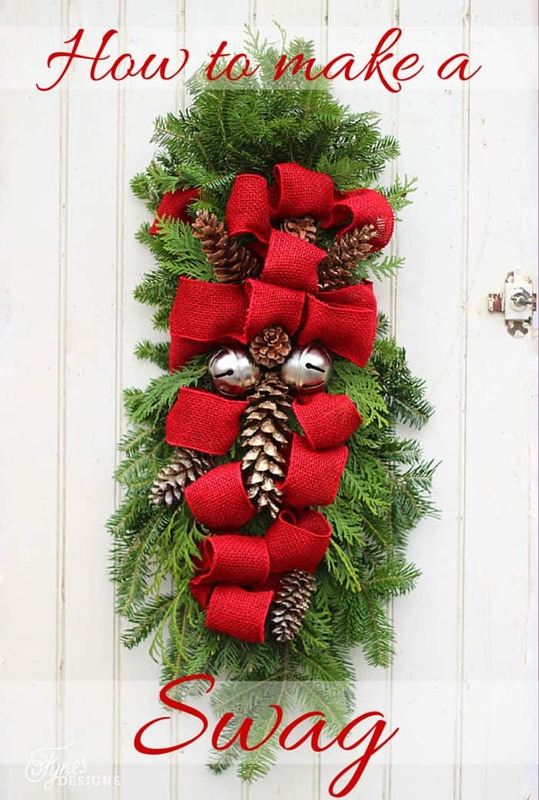 I really want to get wreaths for my windows this Christmas, and I think I should add a swag now, too! I’ll be following for more ideas. I’d love for you to check out my free Christmas Card List template on my blog and linked through The Creative Exchange Link Party. Thanks! Definitely on my to-make list for Christmas 2016. But here in Florida, it will have to be artificial greenery. Real evergreens would have survived about a day in our 2015 holiday heatwave. I put out luminaries Christmas Eve wearing shorts and a tee shirt! Thanks for the step by step. Just beautiful! I’ll definitely do this!